The 27-year-old victim is in hospital after the attack at a flat in Drive Road, Govan. A man has been seriously injured after two masked men forced their way into his Glasgow flat and attacked him. 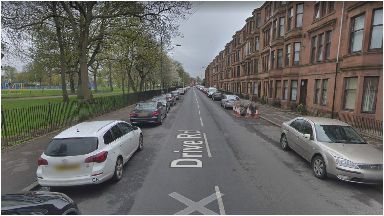 One of the attackers also wore goggles during the assault at the flat in Drive Road, Govan, at about 11.30pm on Wednesday. Police said the 27-year-old victim is in a serious but stable condition in hospital. They believe he was the intended target of the assault. Both suspects ran off after the incident. Detectives are now appealing for witnesses to help their investigation and have been carrying out door-to-door enquiries. They are also gathering CCTV footage for review. Detective Constable Liam Brophy said: "We believe the victim was the intended target for this attack although it's not clear why the man has been assaulted. "I am appealing to local people in the area to think back and consider if they saw or heard anything which could assist our investigation. "Any small piece of information could prove significant in our enquiries, so please do pass any information on."